I know, I get that same reaction from everyone. I teach at a low socioeconomic Title I Correct 2 middle school that feeds into every high school in Lakeland. What does that mean you ask? It means like 80%+ of our students (don't know the exact percentage) are on free/reduced lunch plans, hundreds of our students are bussed from ALL over Lakeland, and we haven't made AYP in 4 years. We seem to be the last stop before some kids are sent to the alternative school, Bill Duncan, and we tend to be the "dumping grounds" for when "The Dunk" as the kids call it, is done with them. But what does this really boil down to? It boils down to the fact that the vast majority of my students are starving for attention - - - any way they can get it. Just yesterday I learned (through an essay I assigned for them to write about their father OR a male figure they respect like a father) that TWO of my students literally do not have any male figures they look up to in their lives. I wanted to cry. WHERE ARE THESE MEN?!? As I sit here, I am thinking of about 10 students of MINE that are already in gangs. Some are quiet about it. Others are loud and proud. It's disheartening really. But it's reality. I sat talking yesterday morning with my co-worker friend who is a Christ follower about the sadness of it. I told him I didn't understand why these gangs that you have to be jumped into are so appealing to these kids. He, understanding their mentality, told me it was because the gangs give them what they are thirsty for - loyalty, appreciation, and family. FAMILY. Last night at our small group, we watched a segment from Francis Chan's BASIC series about fellowship and how that is really supposed to look in the church. He mentioned a story about a guy who was in a gang but came to their church and decided to give it all up and follow Christ, but after a while he quit coming to church. When he was finally asked about his absence he told him it was because he thought that when he joined "the church" that it was going to be like a family where people let you in, are loyal, appreciate you, and would do anything for you, but that he must have gotten it wrong. Francis' reply was that no, he got it right....the Church has gotten it wrong. The juxtaposition between my conversation earlier yesterday and that video last night was not a coincidence. God was trying to open my eyes to the reality right there in the four walls of my classroom. The other comment my co-worker made was that they (the gangs) simply got to them first. That...breaks my heart. And it should. Because Francis is right - the Church (the body of believers that calls themselves Christians) has gotten it wrong. This is why I am so thrilled to be a part of Fuel Community Church where their target is young people...where the VISION is to reach every young person (30 years and down if I'm not mistaken) in Lakeland. Impossible, you say? Not with my God. Because here's the thing - gangs wouldn't have to exist. They could stop recruiting. IF...IF...IF...we, the CHURCH, do what we're supposed to do. What does that mean? It's really very simple. WE HAVE TO GET TO THEM FIRST! If you know me at all, you know this to be absolute truth. But, ladies and gentlemen, God is stretching me in ways that I never even imagined. He is taking areas of my life that I haven't looked at very closely and bringing them to the forefront. Some of these things scare me. I don't like failure...so the thought of failing at any of this really scares me. But if everyone just chose not to try because they were afraid of failure, well, I dare say we probably wouldn't be here today. 1. The first thing it has you praying for is yourself...that you will be open and honest in your prayers and let God change your heart where needed. It also talked about how no matter the situation, even if you as the wife are the one working and the husband stays home with the kids (my current situation), he is still the head of the household and you are the heart of it. That means, as the heart of the home, I still have the responsibility of making our home a place of peace, comfort, and security. That means cleaning up, keeping up with laundry, etc. Now, Jason does an excellent job of that as well BUT it is still my duty as the wife. I know this but I haven't ever really done those things with the right heart. Tonight was different though. Jason had Gabe's dinner ready when I got home and we had leftovers from yesterday. I spent time playing with Gabe after dinner and then after putting him down for the night, I gladly (this is so strange) picked up all his toys and put them away, swept the floor, folded clothes, put his load of laundry in, and did the few dishes in the sink. Yea, I said it.....gladly. My heart was different about it. I felt happy to be doing those things. Weird, right? 2. Another area of prayer is my husband's health. As I read that chapter I thought to myself, "How can I possibly pray for my husband to eat healthy, choose the right foods, and exercise regularly when I don't do it. Isn't that sort of...hypocritical of me?" Well, tonight we turned on a documentary called "Forks over Knives" detailing how eating meats and other products from animals (yes, eggs, milk, etc.) actually causes many of the health problems today and that members of clinical studies done who were pretty much waiting at death's door started eating a plant based diet void of meat and dairy and actually REVERSED heart disease, osteoporosis, diabetes, cancer, etc. I've always known that my body is a temple of the Lord but I don't treat it as such. I treat it more like a garbage heap than anything. This has really started to bother me. This documentary just enlightened me. So, starting this week, Jason and I are really going to try this. It will require more work on my part because I am such a picky eater. I will have to actually FORCE myself to eat certain things but if that's what it takes to be healthy and to treat my body the way it should be treated, then so be it. Join us in prayer will you? It won't be easy and I am certain we will falter at times. But as one diabetes reversed woman on the program said, "You might lose a battle or two but don't lose the war. If you fall, get back up. Not tomorrow, not next week, but right now." So as I continue to have this spiritual awakening of sorts, I will continue to blog about what God is teaching me and challenging me to do. Thanks for reading. ONE: Disposable diapers are ridiculously expensive. A box of 96 that costs around $20 lasts maybe two weeks (if we're lucky). That's $40 a month (at least) which is $480 in one year...and even that number sounds lower than it actually is. I figure in less than a year, if it takes between $200-$300 to start cloth diapering, it would have paid for itself in 6 months...maybe even less. TWO: It is better for the environment. I don't even want to think about the amount of diapers housed in the landfill right now. I'm not a tree hugger or extreme environmentalist but I do care about this planet that God created and I want to be part of protecting it. THREE: This ties in with #1 but I want to be a good steward of what God has given me. I think if I can find ways to cut our costs down so that in the end we have more to give, He would want me to do that. I'm not saying that tomorrow I'm going to go out and stockpile cloth diapers and ban disposables from my house FOREVER...but I am thinking about purchasing a few and seeing how it goes. I know that I will still buy disposables for trips and keep them to throw in the diaper bag when we're on the go (unless they have a wonderful system for that too) but I just feel like God is revealing ways that we can make a difference in our lives financially and this might be one of them. I've been doing my research and thinking about the kinds that I would want to try out first. Our tax refund should be in this week which would help with start up costs. Although, if I could find someone that had a few that would let us try them out first, that would be amazing. I'm still going to research and look around on the internet for some good deals. Maybe I'll get lucky. Who knows....maybe in the not too distant future I'll be a cloth diapering momma! So if you're a cloth diapering momma, give this 'could-be' some advice, tips, pointers, do's & don'ts. She'd appreciate it! About 8 days ago, my husband and I embarked on a 10 day fast from distracting media. So, for the last 8 days, I have not been on facebook or pinterest, Jason has not played his video games, and we have not watched anything from netflix...except for Sesame Street (and one movie I watched with my mom)...and that's more for Gabriel (although, I must admit, I do love Elmo). Every morning I get up and read about 3 chapters in the gospels (something I was supposed to be doing for weeks with my church family and fell behind....because of aforementioned distractions). My husband and I are both reading books on our own and one together. He is reading "Crazy Love," I am reading "The Power of a Praying Wife," and together we are reading "Forgotten God." It has been great. Last night, during dinner, instead of turning on the TV, we just talked. We hadn't really done that in a while and it was so nice to just talk about all sorts of things. I feel like my energy comes from the Word every morning. We are praying more specifically for certain things. We can both feel God working away, chiseling away the stuff that doesn't need to be in our lives and molding us into the beings He wants us to be. It doesn't always feel good, since He does like to reveal areas of our lives that need serious work, but while it may not feel good...I know it IS good. I haven't even missed facebook. I'm sure I'm missing out on some news here and there but I would just go on there and spend way too much time doing mindless things. I would hear God telling me to get off and spend time with Him and I just wouldn't. I was being disobedient. When our fast is up in a couple of days, I will go on facebook just to check and update, maybe upload some pictures of my boy so others can stay abreast of what's happening....but I've decided that 10 minutes a day is my max. I will check it only after I have spent time with my God, son, and husband each day and only at the end of the day. If I feel like it starting to take up too much time again, I will do another fast. I have such a far way to go and I know I will never be where I NEED to be....but I can always be headed in that direction. I can stay on the narrow path following Jesus, daily dying to myself, bearing my cross, and hopefully becoming less of me and more of Him. Jesus is pretty clear about what it takes to follow Him. And I can honestly say, I haven't been doing that very well. But I am trying. I am taking steps to really follow Him. It's not easy. But it's worth it. I seem to be struggling with that in my profession these days. I know that when these kids deserve it least is when they need it most but it is HARD. The same complaints keep cycling through my head: "they don't listen," "they don't seem to care," "they aren't learning anything," "what's a person gotta do to get some respect," "Is it EVEN worth it?" Couldn't God say the same about us? He could. He could just decide He's had enough and smite us all. But instead, He loves us. Right. Where. We. Are. At. I've been doing some soul searching lately...or maybe the better term is "soul scrutinizing." I just finished reading "Crazy Love," a book by Francis Chan and it has completely shifted my thoughts and views on being a follow of Christ. Sad that a book other than the Bible was the culprit here, but it's true. He didn't write anything in his book that is not backed up by Biblical truth...and yet, we still miss it. I am first in line to tell you that I am not perfect. But if I were, then I wouldn't need Jesus, and this whole post would be pointless now wouldn't it? But I'm not perfect and I do need Jesus....like I need air to breathe. Do I believe that? Yes, I really do. I've always viewed my walk with Christ as a comparison to others. "Compared to others" I am doing pretty well. I try not to cuss, I don't drink or smoke, I try to be kind to others, I try to give when I can, and I try to fit in some bible reading here and there when I get the time. But THAT, my friends, is why Christians are the main reason so many people don't want anything to do with what we have to offer. We compare ourselves to the rest of the world and think, "Oh, look at me. I'm doing way better than that guy over there." In reality, we should be viewing our life under the magnifying glass of the Holy Word of God. We (me being at the top of the list here) need to stop comparing ourselves to the rest of the population and compare ourselves to the profile of a Follower of Christ that Jesus outlines for us in His teaching. The follower denies himself daily, takes up his own cross, and follows after Christ with reckless abandon and childlike faith. When I stop comparing myself to others in the world, and compare myself to the follower Christ describes, I'm not doing so hot. Matter of fact, I'm a miserable failure. But then again, that's what grace and forgiveness are for. I want to be the follower that Jesus describes. I want to get to the point where I am daily offending people with the Gospel because we carry an offensive message. It is not easy. 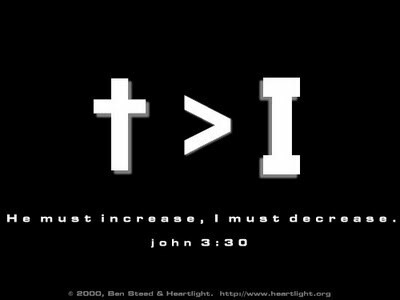 Every single day I must decrease and Christ must increase so that eventually, the outside world will no longer see me but they will see Christ that lives in me. I changed my blog title. While I will still post the joys and challenges of raising an active and precious little boy, my life needs to be more about Christ than anything or anyone else. That's a tough pill to swallow for a mother. Mothers instinctively put their children first. It's our natural tendency but Christ clearly states that there is to be no one before Him. With that said, the title is now "Confessions of Someone Just Trying to Get it Right." This is my new journey of letting go and letting God. Starting tonight, my husband and I are going on a media fast. For 10 days (or maybe longer depending on what happens), we are going to fast from media distractions: me from facebook and pinterest, he from video games, and we from netflix. We don't have cable so no worries there. We are going to unplug from the media world and plug into the God world. In our spare time that we would normally waste browsing, watching, listening, etc., we are going to dig deeper into God's word together and really focus on growing our relationship in Christ both individually and as a couple. I will still allow myself to blog if I have something I need to say that I don't want to forget: perhaps snippets of what we are learning. But, for the most part, I will be unplugged from the World Wide Web. Perhaps there are areas of your life that you are distracted in as well. I challenge you too...go on a distraction fast. Fast from those little distractor demons in your lives and dive into what God has for you. I'm excited about the next 10 days and what God is going to reveal. If you do decide to take on the 10 day distraction fast, leave me a comment and tell me what you are fasting from...I will be glad to pray for you.